Click the Search command on the Edit menu. Click the Search button on the main toolbar. You can search for events, tasks, notes, and contacts by using the Search window. 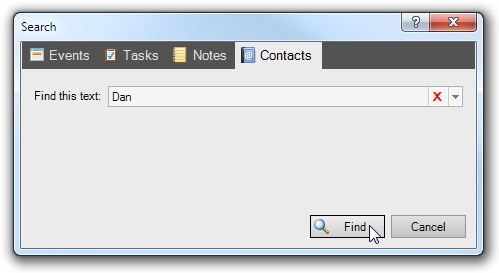 This window is displayed when the Search command on the Edit menu is used. Search results will be displayed in the Event List, Task List, Note List, or Contact List, depending on the type of data searched. The only functional difference between using this window and commanding searches directly from the "Search" field in the list views is the search can be narrowed down to specified fields. When searching from the list views, all fields will be searched, which could cause more search results to appear than expected. Each tab in the Search window will contain a "Find this text" field. This is where you can specify the text you'd like to find. A list of recent searches can be accessed from the drop-down button. The text is not case sensitive. You can clear all previous search history by clicking the red X. To search for events, use the Events tab to specify the text you'd like to find and the field to search. You can search any text field, or narrow the search down to event titles, locations, or descriptions. A date range should also be specified. Events outside the specified date range won't be shown in the search results. You can select a pre-defined date range, such as "This calendar year", or enter whatever start and end dates you'd like. 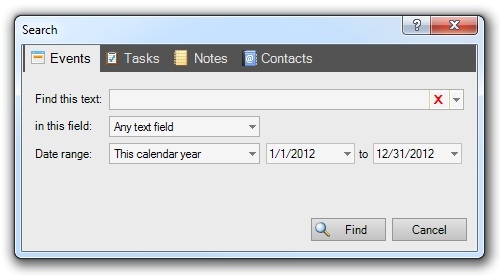 Dates can be typed using the keyboard, or selected from the drop-down button. After specifying the search parameters, click the Find button. Search results will be shown in the Event List. 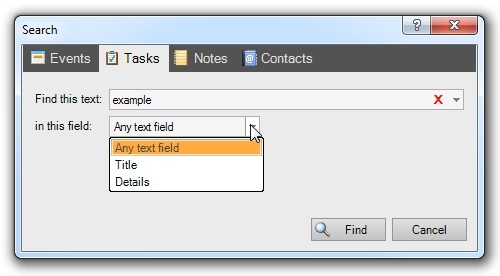 To search for tasks, use the Tasks tab to specify the text you'd like to find and the field to search. 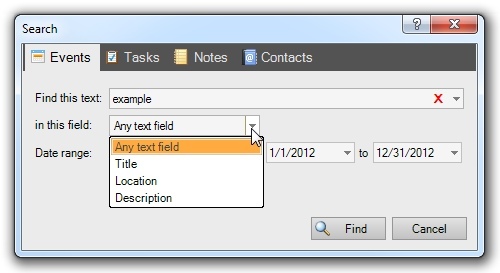 You can search any text field, or narrow the search down to task titles and details. A date range should also be specified. Tasks that are due outside the specified date range won't be shown in the search results. You can select a pre-defined date range, such as "This calendar year", or enter whatever start and end dates you'd like. 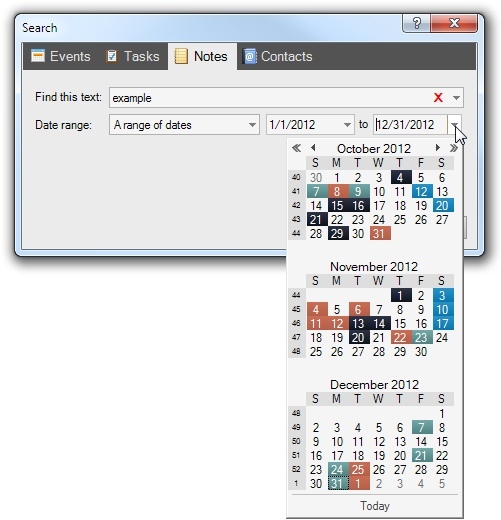 Dates can be typed using the keyboard, or selected from the drop-down button. Note, tasks that don't have due dates will always be searched, regardless of the specified date range. After specifying the search parameters, click the Find button. Search results will be shown in the Task List. To search for notes, use the Notes tab to specify the text you'd like to find. A date range should also be specified. Notes that are pinned to dates outside the specified date range won't be shown in the search results. You can select a pre-defined date range, such as "This calendar year", or enter whatever start and end dates you'd like. 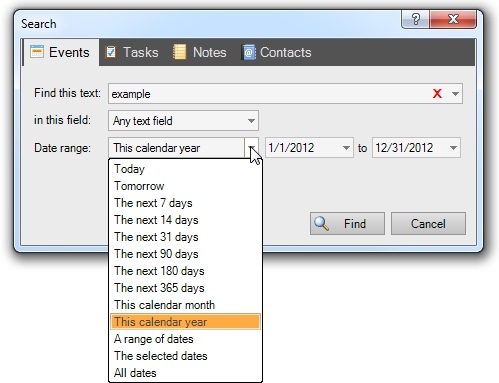 Dates can be typed using the keyboard, or selected from the drop-down button. Notes that aren't pinned to dates will always be searched, regardless of the specified date range. After entering the search parameters, click the Find button. Search results will be shown in the Note List. To search for contacts, use the Contacts tab to specify the text you'd like to find. No other input fields need to be specified. All contact data fields will be searched. Contacts containing the specified text will be shown in the Contact List.